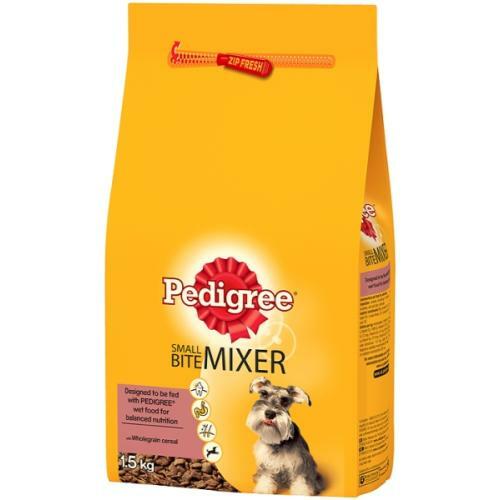 Striving to lead the way in pet nutrition Pedigree Original Mixer Small Bite Dry Dog Food is a delicious way to compliment a wet food add extra depth in flavour and crunch in texture. Designed to help support the growth and development of your dog the small bite dry mixer offers complete nutritional balance in a smaller kibble for little jaws. Combined with a wet food which high in moisture content with less calorie density the dry mixer helps increase nutritional value and look after your dog’s dental hygiene. The A good balance of omega 6 and vitamin E when mixed with canned food will keep fur glossy and skin healthy. Strong teeth and gums! Specially shaped crunchy bits to help keep their teeth in top condition for all those games of tug-of-war. Plus there's no added sugar. Easy digestion. Wholegrains, naturally rich in fibres, aid proper and complete digestion, so he's always bursting with energy.